Hello my bloggy friends. I've called all of you together to let you in on my news...of course, you may have already guessed, based on the picture I posted on last Wednesday's post. That one was the best I could come up with. What I really saw? Well, let's just say that while I wasn't happy, I also wasn't surprised. Apparently nearly two months of not running, coupled with worry and stress and chocolate, have combined to give me a spare tire around my stomach. Not surprising, as that was the last place that I lost weight, so it only makes sense that it was the first place to return. When I put on that running outfit and took a picture, I realized that I had not been following something I've preached for the last couple of years - namely, wear clothes that fit. I have one pair of jeans - well, two really, but one pair that I love, so I only wear them when I'm going somewhere. And since I'm not working, I have days when I don't go anywhere. What was I wearing in the meantime? Stretchy elastic in the form of cozy warm sweats or yoga pants. Layers of souvenir race cotton t-shirts, my purple puffy down vest, a fleece top. Thick socks. Hey, it was winter, I was cold, and comfort ruled. Yeeaahhh, kind of a mistake. Now don't get me wrong - my jeans still fit. But. They are definitely tighter than they were when I bought them. And I can't blame it on dryer shrinkage, because I hang them to dry. It started with my ankle injury, and the fear and frustration that went along with watching my plans for my half marathons disappear. Chocolate helped. Adding toppings to my frozen yogurt - something I NEVER did, also helped. Who knew mini dark chocolate chips would be so good on cherry frozen yogurt? Never mind the gummi bears (I don't understand that one either). Then the news of my mom's cancer came. Holy blindside, Batman! That was something I honestly never thought I would have to face. The next few weeks were a combination of tears and chocolate. When I would write an email to someone updating them on my mom, my emotions would be so overwhelming that I oftentimes would have to stop and go eat a piece of chocolate. Or a cookie. And that helped - momentarily, at least. Sometimes that's all you can do, is get through to the next moment. But things have gotten better. And while I know that chocolate cannot cure cancer (nor can See's Candies, no matter what Janell says, lol), it does help me deal with the out-of-my-control things that are going on. So. What's next? Well, it started with walking. I'm treating walking like I did running, with a schedule during the week, and then a longer walk on the weekend. I do really well with an exercise routine. I'm eating food that is good for my body - I like the way I feel when I have a diet with a lot of fresh fruit, big salads, Greek yogurt and whole grains - and since I'm not running, I don't need to be eating pasta, pretzels or bagels at the moment. Hopefully with walking off calories, eating right, and not adding any "hunger" calories (from running), this will get me back to where I was, although I think to get back to my absolute lowest (which is where I was last summer), I'd really have to diet, and I'm not quite in that mindset - yet, anyway. I don't drink, I don't smoke, I don't do drugs...but as you can see from my "before" pictures, I do, indeed, do food. And while I've been able to get it under control over the last couple of years, the fact remains that I have a lot of practice in using food to solve my problems - or at least make me feel better, temporarily. It is what it is - I'm not a failure. But I've been down this road too many times in the past to not take note and do something, now, before it gets away from me. You will notice that I haven't talked about a specific number on the scale. That's because I haven't weighed myself. Why should I? I can see what I've done - I don't need anything to make me feel worse. This is what works for me...it may not be for everyone, not knowing a specific number, but it's a form of self-preservation at the moment. This is not an "oh my gosh, I look so horrible" post - rather, it's a wake up call - and I'm listening. hmmm Im not sure what to comment. my gut is screaming that I love the post. I adore the fact you're not scalefocused yet for some reason I still wanna admonish you (lovingly of course it's the way I roll) and remind you that D*MN WOMAN youve been under a lot of stress recently, youve been from your routine untimely ripped (oh yes I did try and quote Shakespeare!) and youve done amazingly. I wanna remind you that so many of us would have seized it (AND NOT SO WRONGLY SO!!) to go back to old habits. To heed the call of the poptarts (ok Im projecting :)) and just indulge until the stress vanished. Until we had a few goodyears stacked up. You, my friend, are doing amazingly well. Im here if you WANT a hand, but IMO you dont need on. doing the best you can each day. I love that you are right on it. Of course I want to say that you are enhancing the spare tire to an 18 wheeler, when maybe it is just a tricycle. But nevertheless, you are taking care of yourself (and me) and you are great. You see a tire, I see a ring. Not trying to downplay or make excuses, but you do still look great. Good that you're nipping it in the bud and doing damage control now, though. And elastic is the evil enabler. Good for you. I wish I had stopped myself sooner last year -- but I have no doubt that you will. You already have, just in starting up that walking routine! Now lay off the gummi bears toppings (ew, I understood the chocolate but not that), put on pants that BUTTON closed, and that tire will be gone soon enough! 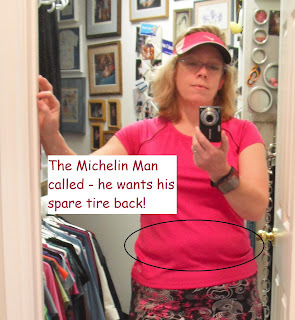 I can't help it but I had to laugh about the Michelin man called :) I might give him a call myself and tell him to collect mine too. I think you're approaching this the right way: no excuses, it is what it is. You've been on an emotional rollercoaster so far this year, first your ankle, than your Mom. I've gained all my weight (and still haven't lost it all) after my Dad died. I had stopped smoking that year on January 1st and in May he died. I thought about smoking again at that time but I didn't, instead I ate, I ate a lot. I think the spare tire will be returned where it belongs soon because you've recognized it and took the steps to get rid of it again. That being said, good for you to get on a walking schedule. Great, great plan. Baby steps, right? I hate to puncture your tire (Ha!) but I'm on the side that it looks a lot worse to you than to the rest of us. "Do the best you can in the situation you're in." I say it all the time (and need to get better at practicing it). Yes, you'd prefer running but best right now is walking and you've recognized and are doing it. In any case, I do so admire that you've wrestled control back from the M&Ms and are putting a good plan in place. I'm sure that "tire" will be gone soon. Your back to your healthy eating habits. Walking really does work but its not as much fun as running I know .....but do what you can for now. I've been away from this end of blogland so glad to see your mom is doing well. Take care of yourself Shelly. I think I have his other 3 tires LOL! I fell off the healthy wagon a few weeks ago and will be heading back to WW meetings tomorrow. I've decided that I am going to take your approach and not look at the numbers on the scale for the next month. I'm just going to do what I'm supposed to do and I'll feel the difference. Knowing and accepting is like 80% of the battle so you're ahead of the game. And you should cut yourself some slack...you've had a rough couple of months!!! Like Carla, I like this post, to me it is encouraging. You aren't offering excuses, you are just stating the facts, and I think the most encouraging and important thing you said is "But I've been down this road too many times in the past to not take note and do something, now, before it gets away from me." You have had a lot to deal with...again, not excuses, just facts. And now you have a handle on it. Back to the jeans, goodbye sweats (I've SO been doing that...Springtime is going to force me to change that habit). You are so right and I totally know where you are coming from! I am now getting back into running after four months of injuries and all my clothes are tight. I refuse to weigh myself until they are loose again and I refuse to buy "comfy" clothes because I love the clothes I have and being that size. Yeahbut, how wonderful that you're paying attention and are putting on the breaks before it becomes a complete backslide! Meant to say this the last time - love the running skirt. I'm glad you aren't really beating yourself up. Nothing worse than gaining some weight and then getting that panicky desperate feeling to get it off NOW! It is so much better to just go back to regular routine and let it fall off as it will. Walk, Shelley, Walk! (forrest gump quote. kind of.) It doesn't hurt your ankle to walk? Can you power walk? Man, that wears me out when I really really do it. Gummi bears on froyo? Thanks for the idea! JK, sort of. I have some B12 vitamins that are like gummi bears, and occasionally I eat them just for fun. And then worry about what an overdose of B12 might do to me. Wow, the scale resistance. Admirable. I was weighing once a week at the gym. Then twice a week. Then I saw a scale on sale for $10 and bought it. And now I've weighed myself two days in a row. And the weight still isn't gone. But its less today than yesterday. Does that count? It's funny, because just this week at WW they topic was "its not all about the scale" both in a good and bad way. You know where you are, you know how to get back to where you need to be - no worries! You still look great! Stay away from the scale. It lies anyway. HI Shelly, BIG hats off to you for nipping this in the bud, betting back on track and taking control! You (like your MOM) are an inspiration!!!! No looking back, only forward, and you'll be back to where you want to be in no time. Have a great day!!!!! I hear ya, sister! Nothing else we can do, but keep on keepin' on! OMG do I know the Danger of the Stretchy Pants. I bought jeans yesterday that are really quite tight and almost uncomfortable. It's the only way I can not overeat at times, because if I have to undo the button, it's time for an Emergency Intervention!!! I feel your pain/weight/fat. After the death of my mom and then a 2-month visit from Dad, my eating plan was put on hold. Funny how hard it is to get a healthy lifestyle established and how easy it easy is to get derailed! But, I got back on plan and fact am moving faster than ever with fat loss (despite my exercise still being kaput). If I can do it - so can you! You have had so much success and are one of my role models for losing and maintaining. So, welcome another cheerleader to your section. Let's go walking! As others have mentioned, I don't see the horror that you do - but to be honest, it's not my own body. I'm sure if I took a picture of myself I'd see things no one else saw, either. You're on the right track - and it's something that I needed to read as well. Well, you had a break in your routine for 2 major reasons, and you are back. I know you will do well, bc you love the way it makes you feel and I think you like your exercise routine. Interesting how that "roll" that you circled (ha!) bothers you now. I think about from whence you & I came, (overweight) & how for ME anyway, a roll (or 2) didn't get my attention back then at all. I ignored. Yet, NOW, after all your hard work, it matters. Not sure I'm makin sense, but I'm just thinking about some of your before pics, and how we went about life for years like that, not circling a thing, & now we 'see' differently, and while you are very small and look great, very diff from before photos, it isn't acceptable to you now. I'm so glad you can walk. Can Paco ever be trusted to go with you, or is there too much of a threat of him attacking someone's dog? Smart move on banishing the scale. You will be back to the old new Shelley by graduation, I'm sure! Wow, graduation...hard to believe. I got very depressed following a family tragedy and gained 40 pounds. Every time life throws me a curveball, I stick a fork in my mouth. I am trying to find better ways of coping. Good luck getting back into the swing of things. Maybe you could go back to your trainers. They could help you by showing you new exercises that don't hurt your foot. Also, they seemed like a good support system for you. I know they cost $$$$, but how much is your mental and physical health worth to you? Good luck Shelly. I am praying for you and your family. I love your sensible approach. You've been on this road long enough to know what really works for you and it is not obsessing about the scale nor is it gummy bears. But, it is realizing when you've been off track and heading back in the right direction. You're such a great example for me. Thank you! Shelley the simple fact that you have come here and pointed out that you want things to change is a big success in my books. Although it probably looks alot worse to you than any one else ( I think you look beautiful) you are stopping it in it's tracks, WTG girl! Sorry it's taken me so long to get here, I am having a real hard time commenting lately and need to get back at it, I just wish there was an extra hour or so in the day ;-). Have I mentioned how inspiring it is that you've taken up walking? I know, life's trying to keep you down, but you just reassessed and moved forward with a new plan. After feeling sorry for myself for four weeks (waaaa, my hand was hurt, waaaa, I couldn't go running either, waaaa, my life was too busy, etc. etc. ), I finally realized that if someone can go through the past few months that YOU'VE been through and still find ways to workout and eat right, I should just shut up and start doing some yoga. Just 20 min here and there, nothing strenuous. And it's amazing how much better that makes me feel. Thanks for putting everything out there for us to see. It helps, it really does. Great, great post! Kudos to you for giving yourself your own wake up call and making a plan to handle it. With all you've had to deal with recently I'd say you are doing phenomenal! Stay strong. You're such an inspiration to us all.